"With the recent news that Windows Phone sold 1.6 million in the first quarter of 2011, I wonder how many more they are going to sell in the third quarter after announcing that they will officially start selling the HTC HD7s at AT&T on June 5th for $199.99!" Not to be outdone by Verizon Wireless, AT&T has announced the release date for the HTC HD7S. The HD7S will be available to AT&T customers on June 5th for $199.99. No word though if AT&T will be running any promotions similar to one being offered to Verizon Trophy buyers. Thanks MadSci for the tip. 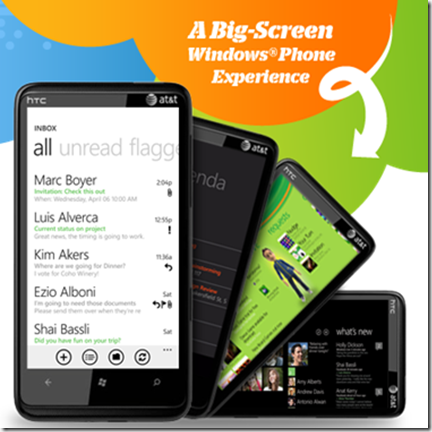 Microsoft still to this day has not impressed me enough to turn in my Windows 6.5 HTC Tilt2 phone. The hardware is lacking in many ways for something to carry the price tag of $199. A single 1 GHz processor, a joke for memory at 576 MB RAM / 512 MB ROM.One mediocre 5M camera. Not much difference from the first batch of WM7 phones. Yawn, nothing new with this machine, I am waiting for the second wave of phones from manufactures, dual processors and front facing cameras can't get here soon enough. That's the good news! Is AT&T adds another Windows Phone, that means people buying them, so there's interest in Latest MS mobile OS. I agree that this phone is no big step up hardware wise from the HD2 - let's face it, it IS a re-screened HD2 in WP7 Drag! But from what I've seen playing around in teh ST&T Stores the new OS is very fast and stable. I love my HD2 - and the NRG ROM I have on it is a blissful improvement over the original (Mine is from Telus in Oz). I adore the customized UI, but I am a heavy email User in a professional environment and the efficiencies I get from customization of WM6.5 are constantly degraded by the frustrations of having to pull the battery or reset it 3 or 4 times a day. This has been a pain since my MPx200 and the culprit seems to be the notification/alarm queue. I have a lot of scheduled events sending notifications to me, along with a zillion emails a day, and if I don't deal with each of them before the next one shows up its always a problem. From what I can tell WP7 is a lot more stable in this area and that make sit interesting to me. I'll miss my customization, and many of the Programs I've paid for on WM6.5 are not available, but I think I will give this phone a whirl nonetheless. Once Mango gets onto it in the Fall (let's hope AT&T understands that should be the Fall of 2011!) it looks like most of the missing things will be in place at last and many advanced features will be rocking along too. I only hope and pray that MS will allow for a better set of Notification options - a single 15 minutes prior notification and one 'snooze' setting is pathetic and will really reduce its value - are you listening MSoft! I'll still put my $0.02 in that I think MSoft blew a real opportunity to attract migration Customers from WM6. I they just did something to offset the cost of purchasing new apps, like giving a Marketplace credit of $1 to $0.50 per Marketplace App on your current Phone it would make the process a lot more palatable. I have an HTC Windows 6.1 phone with the original Tilt configuration that I wouldn't give up for anything else. Glad to find someone who appreciates classic hardware/software. DOn't get me wrong I love Windows Phone 7. I enjoy how it works but it is behind on other hands sets. It is a nice first generation but come on, put the 400+ developers on it again and lets move forward. 6. The physical windows phone button needs to be able to wake the phone up. This is just annoying with coming from iPhone, Android users may not take issue because they use the power button to wake the phone, iPhone does not. 7. Some of the hardware is just a bad layout, the HTC HD7 is a nice phone but the beveled edge that goes towards the screen makes it hard to press the buttons. The rounded edges of the LG-C900 is a better design. APple got this right. 9. When forwarding or copying a text message I need to be able to select more that one item. "1. The phone has a search button on it, yet some hubs (people) also have a search button, this is just redundant and annoying"
Agreed. With a truly context sensitive search button on the phone it is just unnecessary to include one in the UI for an app. "3. Text messages need to have a different color for me versus the recipient. Blue/dark blue"
Agreed as well. Although the indenting helps. "4. The physical camera button is not needed, just give us a virtual one"
I think not. I use my camera button all the time as it wakes the phone up in camera mode with no other fiddling. I have a nephew with an iPhone who can't even get to his camera app before I've got the picture. And with a 4-year-old son, timing is everything. "5. Once you get a lot of apps installed the scrolling is maddening"
AGREED. However, with the physics built into the scrolling function it's still quicker than searching through pages of apps on an iPhone. "6. The physical windows phone button needs to be able to wake the phone up. This is just annoying with coming from iPhone, Android users may not take issue because they use the power button to wake the phone, iPhone does not." Uh... No. Stop trying to make this an iPhone. This is WAY better than iPhone, and any attempt to make it more like that POS just kills it. That windows logo button is too easy to hit and is fairly sensitive, so I can guarantee that if it woke the phone you would be then screaming about battery life. "7. Some of the hardware is just a bad layout, the HTC HD7 is a nice phone but the beveled edge that goes towards the screen makes it hard to press the buttons. The rounded edges of the LG-C900 is a better design. APple got this right." I've had no problems with the buttons on my Surround. Of course, you can continue to let that iPhone slip through your fingers to crack it's dainty little screen on the floor. Just like every iPhone owner I know. I've only dropped my Surround a few times, and its screen doesn't even have a scratch. "8. They need a communicator/messenger client ASAP"
Coming in Mango. It will tie together pretty much all your messenger needs. "9. When forwarding or copying a text message I need to be able to select more that one item."